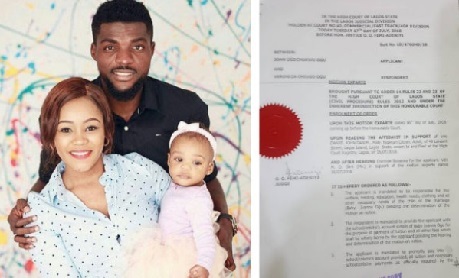 A Lagos High Court sitting in Igbosere, on Tuesday 17th day of July 2018, granted several injunctions against Veronica Chiugo, estranged wife of Super Eagles player, John Ogu, over their 2-year-old daughter, Ivanna Adaeze. This is due to threats she issued via texts messages to the footballer. John Ogu, via a suit filed by the firm of Olumide Babalola LP, seeks the dissolution of his marriage to Veronica Chiugo. #AN INTERIM ORDERmandating the Applicant to be responsible for the welfare, feeding, education, health needs, clothing and all other necessary needs of the child of the marriage (Baby Ivanna Ogu). #AN INTERIM ORDERmandating the Respondent to provide the Applicant with the school/crèche’s account details of Baby Ivanna Ogu for the purpose of payment of tuition and all other fees which shall be wholly borne by the Applicant. #AN INTERIM ORDERmandating the Applicant to promptly pay into the school/crèche’s account provided all tuition and necessary school/crèche payments as officially required by the school/crèche for the benefit of Baby Ivanna Ogu. #AN INTERIM ORDERprohibiting the Respondent from changing Baby Ivanna Ogu’s school/crèche without the written consent of the Applicant. 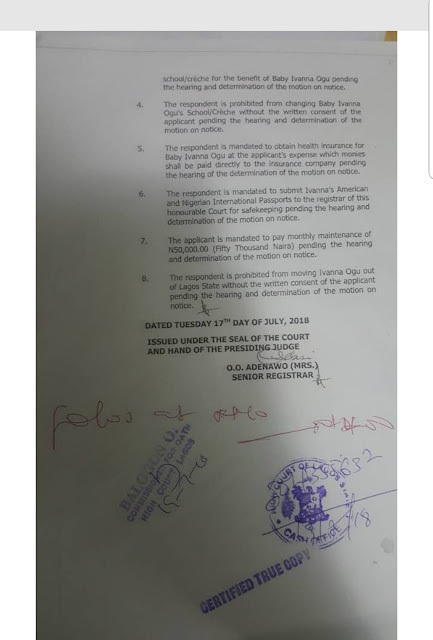 #AN INTERIM ORDERmandating the Respondent to obtain health insurance for Baby Ivanna Ogu at the Applicant’s expense which monies shall be paid directly to the insurance company. #AN INTERIM ORDERmandating the Respondent to submit Ivanna’s American and Nigerian international passports to the registrar of this honourable court for safekeeping. #AN INTERIM ORDERmandating the Applicant to pay monthly maintenance of N50, 000 (Fifty thousand Naira). 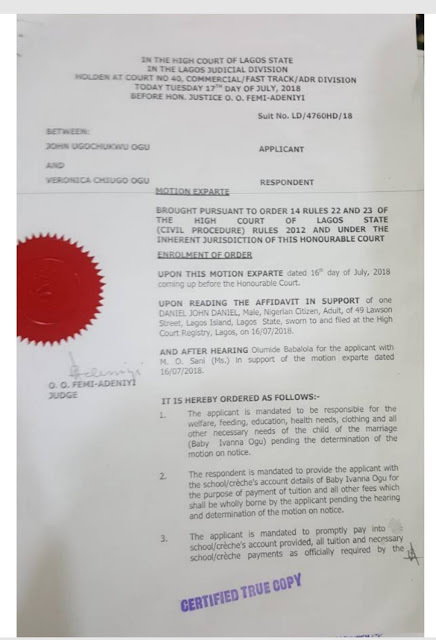 #AN ORDER prohibiting the Respondent from moving Ivanna Ogu out of Lagos State without the written consent of the Applicant. The suit has been further adjourned to 24th July 2018 for further hearing.